A note on the recipes, Ms. Tosi gives both weight measurements and volumetric measurements. As these recipes were made for a professional bakery, I think the weight measurements are more trustworthy than the volumetric ones. I have included both here but I can’t vouch for the volumetric measurements. 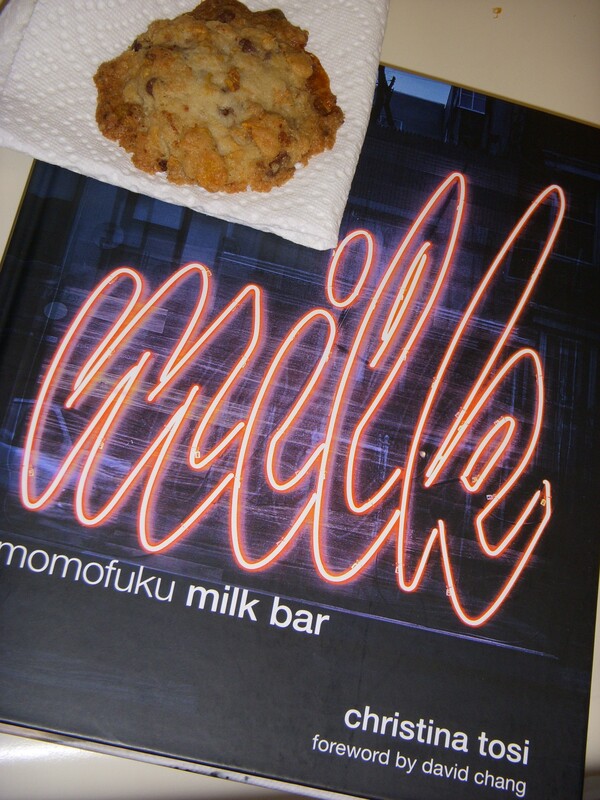 Also, Ms. Tosi notes in the book that she only uses bread flour because it has higher protein content. I have followed these instructions and I still find the cookies spread during baking. Finally, the salt used is kosher salt. This is important to note because the volumetric measurement of table salt may be too salty due to the difference in crystal structure of the two salts. Table salt is more densely packed than kosher or sea salt resulting in finer crystals, so measuring the same volume will not result in the same amount of salt. (This is why some people use sea salt to reduce sodium: sea salt has less sodium then an equivalent volume of table salt.) Measuring the salt by weight removes the problem of crystal size so you could use whatever kind of salt you prefer. Most of the recipes in this book require several steps and this one is no different. Before you make the cookies, first you need to make to cornflake crunch. In a bowl crush cornflakes with your hands until they are 1/4 of their original size. Mix cornflakes with the milk powder, sugar and salt. Add the butter and toss to coat. 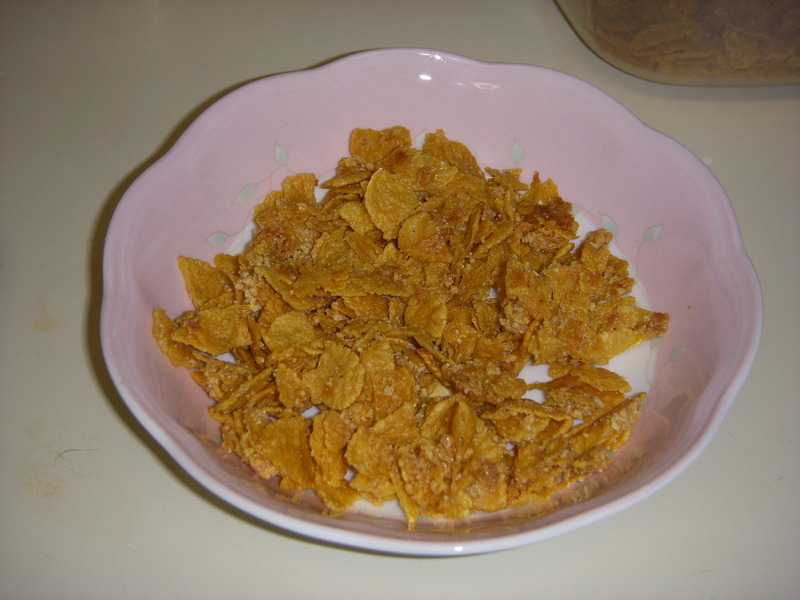 The result should be clusters of coated cornflakes. Spread the clusters on a baking sheet lined with parchment or a Silpat. (For me, the clusters filled the entire cookie sheet in a fairly thick layer.) Bake for 20 minutes. The clusters should look toasted, smell buttery and crunch when you chew them. Cool completely. Store in an air tight container for up to 1 week or in the refrigerator or freezer for 1 month. I know these look like cornflakes, but they are coated in sugar, salt, and milk powder! Now onto the actual cookies! Add in the Cornflake Crunch and chocolate chips and stir to combine. Fold in the mini marshmallows. Arrange the cookie dough disks on a parchment- or Silpat-lined cookie sheet and bake 8-10 minutes. 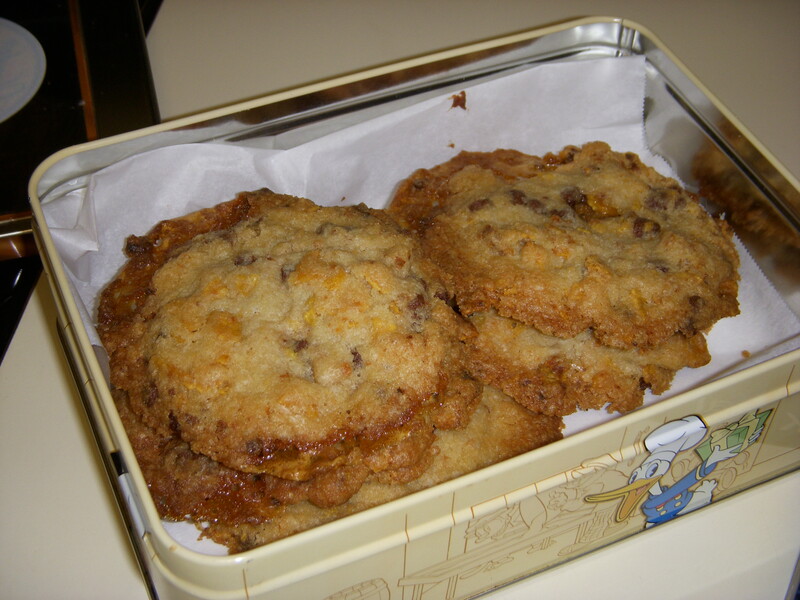 The cookies should be browned on the edges and slightly brown on the top of the cookie. Cook for a few additional minutes if they are too pale and doughy on the surface. Cool cookies on the sheet pans before moving to a cooling rack. Store in an air tight container. These cookies will keep 5 days at room temperature and 1-2 months in the freezer.